A little over four years ago three women were introduced in a local coffee shop. Coming from different regions of the country, bringing different experiences and perspectives, together they agreed that ‘Every Choice Counts’. So, on Earth Day 2010 they invited others to come together to talk about what is special about our community and how to preserve it. 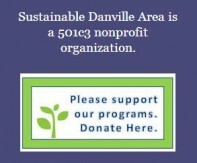 And on that first evening, neighbors and community leaders launched Sustainable Danville Area. Similarly, seven years ago a man used his position to alert the public to the changes we were facing from carbon pollution. Perhaps his message got missed by some because he was a politician or perhaps it was too perilous of a message for some to face. But over time there has been a change of heart, an acceptance that perhaps we can live a little more lightly on the Earth and preserve what we have for our children. Maybe, like me you are enjoying our lovely spring air and cherish the difference from the gloomy, dry, polluted winter days. Perhaps you’re ‘banking’ your children’s and grandchildren’s future and you want to make sure they will have the outdoors that we call our ‘backyard’ to enjoy years from now. Whatever your reason, more of us are remembering to bring re-useable grocery bags, forgo the plastic water bottle and we’re even using public transportation more today than any time since the 1950’s. In the line at the store, the cashier told the older woman that plastic bags weren’t good for the environment. The woman apologized and explained, “We didn’t have the green thing back in my day.” That’s right; they didn’t have the green thing in her day. Back then, they returned their milk bottles, soda pop bottles and beer bottles to the store. The store sent them back to the plant to be washed and sterilized and refilled, using the same bottles over and over. So they really were recycled. But they didn’t have the green thing back in her day. Back then, they washed the baby’s diapers because they didn’t have the throw-away kind. They dried clothes on a line – wind and solar power really did dry the clothes. But the woman was right; they didn’t have the green thing back in her day. They drank from a fountain when they were thirsty, instead of using a cup or a plastic bottle every time they had a drink of water. When they packaged a fragile item to send in the mail, they used wadded up newspaper to cushion it, not Styrofoam or plastic bubble wrap. But they didn’t have the green thing back then. Back then, people took the streetcar and kids rode their bikes to school or rode the school bus, instead of turning their moms into a 24-hour taxi service. And they didn’t need a computerized gadget to receive a signal beamed from satellites 2,000 miles out in space in order to find the nearest pizza joint. But then ……. they didn’t have the green thing back then! 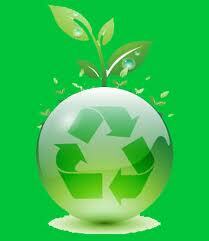 We may not have had ‘the green thing’ back then, but we lived our lives with integrity for the Earth and our resources. We made ‘Every Choice Count’. To celebrate Earth Day this spring, perhaps you and your family will adopt a few of these practices for a day or a month and see that living lightly really isn’t inconvenient at all. Is your child a ‘Kid-casso’? Danville and Alamo K-12 students are invited to participate in 4th Annual Earth Day Student Art Contest and have their art displayed in the Town of Danville Community Center on April 19th. Deadline April 5th. Along, with the San Ramon Valley High School E2 Club, we’ll host The Climate Reality Project, a multi-media update on ‘An Inconvenient Truth’ on Tuesday, April 8th at 7:00pm at SRVHS Performing Arts Center 501 Danville Avenue. Pack your picnic or purchase lunch and snacks al fresco from La Boulange Bakery and Café while enjoying live music and playing with our Giant Earth Ball! 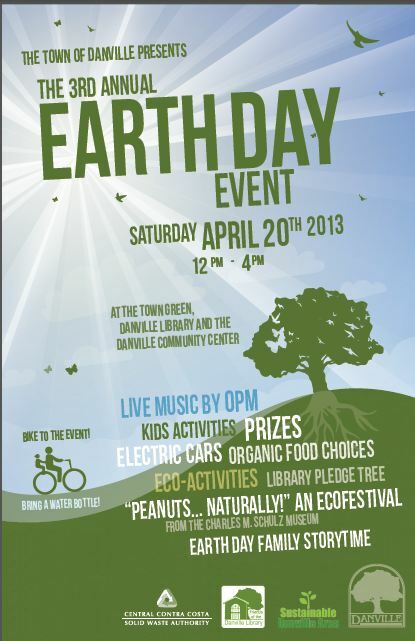 The 4th Annual Earth Day Event hosted by the Town of Danville, Sustainable Danville Area and the Danville Library presents fun for everyone on the Town Green in front of the Community Center and at the Danville Library at 400 Front Street. Saturday, April 19th 11am – 3pm.